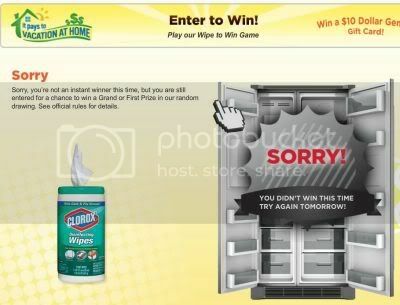 This is a Sponsored post written by me on behalf of The Clorox Company for SocialSpark. All opinions are 100% mine. I recently went on a scavenger hunt, looking for my special cleaning products. I have a very sensitive nose and so many of the new products contain very pungent (read: unpleasant) smells that burn my nose. So I stick with the stuff I’ve purchased for decades. Take Pine-Sol®, for example. My mom used it when I was little and I used it now. I actually prefer the “original” smell and I think the stuff works great. My local supermarket had run out of the stuff last week, so we sauntered to Dollar General®. They have it! It’s even better to WIN a contest while nabbing a great deal. Dollar General® is currently running the It Pays to Vacation at Home sweepstakes. It’s cute. You register for the contest and play a little “wipe to win” game. You can win a $10 Dollar General® gift card, and be entered to win a $25 gift card or a $500 “paycheck” to take a vacation at home. Sheesh, we vacation at home all the time! I think I would probably spend my “vacation” money on a nice local restaurant meal and maybe for gas to go to a day trip to the Adirondacks or something. The $500 just might pay for the gas. 😐 There are 20 Grand Prizes or 100 First Prizes, so there are lots of opportunities to win! I played once and didn’t win, though. Bummer. It’s free to enter the contest, although you do have to enter your name, address, email, phone number and birthday. It’s quite a lot of information to submit for a $10 gift card… read the terms before you play. Good luck! I love, love, love Dollar General ! I shop there a lot. I prefer them over Family Dollar. Their store brand items are a great value and quality. I even ordered from them online and got free shipping (when you spend at least $25). I wasn’t feeling good but needed some items from there and it was really easy to order online. I got my package fast too!! I am going to play the contest! Thanks for sharing!